If you’re like me and don’t have time to live on your Entrecard Dashboard, you’ll know it’s hard to keep track of who has dropped a card on you. The dashboard only shows the last 15 cards which have been dropped. You’ll notice there is an RSS button at the end of the cards that you can subscribe to, which is very handy. But I find I lose track of who I’ve visited today or whether someone is simply responding to my drop. But there is a “secret spot” which was uncovered by one of the Entrecard Members that enables you to see the last 98 cards that have been dropped on you and whether or not you have visited them in the last 24 hours. There are two ways to view this information. The first one is to click in the “secret zone”, which is located below the RSS button, to the top right of the “t” in widget. You need to hover around there until you get the little finger pointer. Alternatively you can go to your dashboard and type “inbox” (without the quotations) at the end of the URL – which will then look like http://entrecard.com/user/9999/inbox. If you look very closely at the third row you will see a subtle difference in the first two cards. They have a black border, whereas the others have a gold border. This indicates that I haven’t dropped a card at those sites yet. I should also mention that clicking on these cards take you straight to the blog in question, bypassing the profile page (which speeds up the dropping process substantially). I hope you find this tip handy . More than you will ever know babe! My time is so limited right now and Entrecard is the last thing I am thinking about! But this will make it easier. Something weird though. Every time I try and do a mass drop Firefox dies on me. I am wondering if it doesn’t like Entrecard. And the fact that the site seems to be down every time I have a chance to have a look around! You always explain things so well Meg. Thanks. That’s a VERY handy tip Meg – how did you discover all that?! Hey has your entrecard disappeared? Mine has. Great tip. I’ll use this all the time. Just set up my feed. Thanks for the advice. Very cool tip…thanks for sharing! Also, CB – apparently, the disappearing cards was due to Amazon being down (I noticed it too this morning when I was on the computer before heading out). 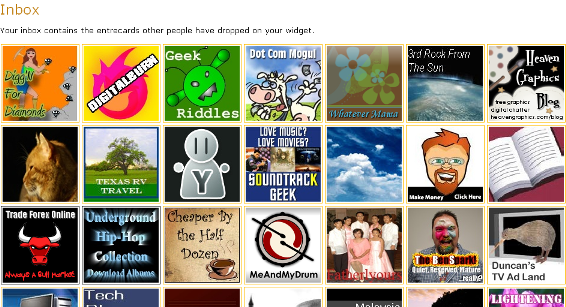 Bec’s last blog post..New Adtoll Page Peel banner! Sweet! Hey Meg, thanks for the amazing tip. Really makes entrecard so much easier to handle. Thanks for the tip. I have always wondered how to figure out who’ve I dropped on. I’ll keep opening up blogs that have dropped on me and forget that I probably dropped on them first….awesome find. That’s such a handy tip. I opened the ‘inbox’ this morning, opened each of the sites in new tabs and clicked lots of cards. Great tip! This will be really helpful! I have been using this for a couple of days. I love it. So easy. I didn’t know about the borders though, thanks for the info. At first I did not think this was true but then I tried it and actually found the inbox. Then I dropped on some pages and when I refreshed the inbox the colors had changed. This is really great and thanks for posting about and making me a believer!! Thanks, I knew about the hidden dot, someone was nice enuff to tell me about it in the forum. They said to hit ctrl a. I did not know about the black border this will help this newbie out alot! This is a test cos you said I could try you. Feel free to delete it cos it won’t make sense to anybody else and I wouldn’t want to mess up your nice comment list here. I haven’t placed all that many ads yet, but I suppose it’s like many things – the more you put into it the more you get back…. The traffic is getting better though (in terms of time on site, page views and bounce rate – but that could have had something to do with a highly relevant post (ie this one) being displayed on top all weekend).